The standard RPS "VR" base can be furnished with a continuous closed cell neoprene gasket on either the top, bottom, or both surfaces. One or two inch extruded aluminum extensions are furnished when the supported equipment's base rail exceeds three inches high. 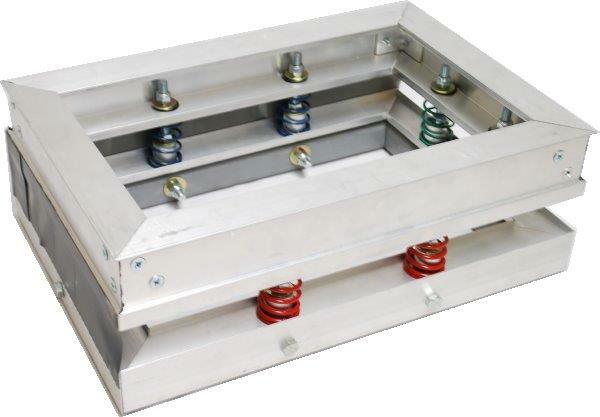 For a condenser section supported by a separate Equipment Rail, a separate aluminum spring rail or two individual spring isolators are required to support the condenser section. Each Vibration Rail is custom designed to fit between rooftop equipment and an RPS roof curb, providing continuous support and an air and watertight seal. The "VR" base combines extruded aluminum construction with 1 inch deflection zinc-plated springs, totally enclosed to provide weathertight and corrosive protection. Springs are free-standing, laterally stable, and computer selected to ensure uniform loading and deflection for the entire system. To simplify installation, "VR" bases are manufactured and shipped in four individual rail sections along with the desired Roof Products & Systems roof curb. Once at the jobsite, they are designed and manufactured to fit together and mate with both the RPS roof curb and the supported equipment above. Provide factory-insulated premanufactured roof curbs of Style RC-(use suffix corresponding to curb profile desired) with "VR" Aluminum Bases incorporating one inch static deflection springs as manufactured by Roof Products & Systems, Huntsville, AL, at all roof openings as shown on drawings. Curbs shall be of box section design with full base plate, 18 gauge galvanized steel with continuous welded corner seams, factory installed wood nailer with concealed fasteners, and shall be insulated with 1-1/2" thick 3 lb. density rigid fiberglass board encapsulated top and bottom. Curbs shall include any required internal stiffeners to support specified equipment above. Minimum curb height to be as shown on drawings and shall accommodate designed deck slope to provide level mounting surface for specified equipment above. "VR" Aluminum Bases shall provide continuous equipment support and weathertight protection. The "VR" Aluminum Bases shall consist of four separate sections with mitered, pre-drilled corners for field assembly using factory supplied self-tapping screws. All joints to be sealed with a bead of resilient silicone caulk. Related Equipment Rail supports shall include a separate aluminum spring rail or two individual spring isolators as shown on drawings. Premanufactured curbs shall include all burglar bars, liners, and other options as specifically shown on drawings. All air ducts, gas, water, and electrical piping and conduits shall be flexibly connected to prevent vibration transmission to the building structure.